Don't adjust your screen. 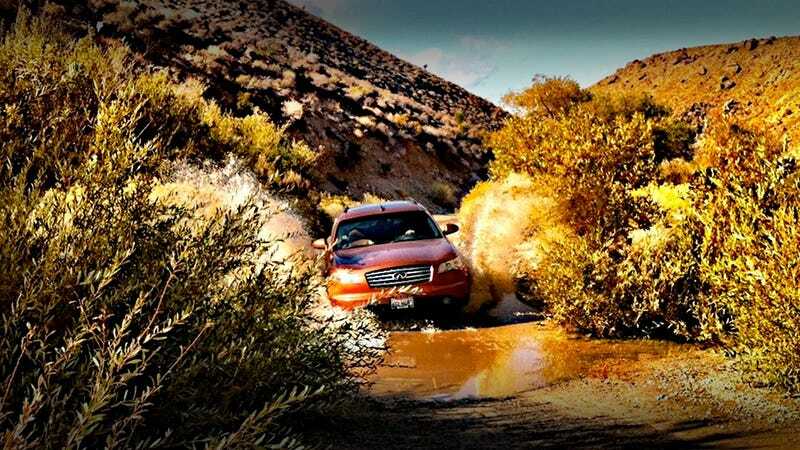 That is a 2003 Infiniti FX35 splashing through mud on Saline Valley Road, the 78-mile dirt route into Death Valley, "the most desolate wilderness in North America." It's what we did, without dying, last weekend. Here's how. Here in 'murica, we're blessed with a plethora of extraordinarily capable off-road vehicles. Hell, the average full-size pickup can handle the Rubicon Trail these days and if you spend up just a little more, you can get a truck capable of entering The Dakar in stock form. But, the majority of Americans able to spell their nationality correctly don't have something with 34-inch tires in the garage, they have everyday vehicles that have to drive them to work and the grocery store in addition to providing weekend recreation. Not owning a lifted Jeep with locking diffs and 20 gallons of fuel on the roof doesn't mean you can't go off-road. Automaker marketing has us believing that we need more capable vehicles than we'll ever use. Most off-roaders will never use the full capability of their Raptors just like most Porsche owners will never set ring records. Own an AWD crossover with a little ground clearance? That's really all you need, if you know what you're doing. A couple weeks ago, my friend Frank and I decided we needed to spend a weekend in the wilderness. And we did mean wilderness, not one of those cheesy organized campsites with crying children running generators all night and metal fire rings. We decided on Death Valley and began Googling spots for wilderness camping. Death Valley National Park has something like 1,000 miles of dirt roads, running the gamut from graded and maintained to stuff you actually would need that lifted Jeep to get down. His Infiniti has decent ground clearance, but none of the other off-road accoutrements we've come to expect from SUVs. Low profile tires sit on 22-inch rims, there's no low-range transfer case or hill descent control and really anything beyond the ability to manually override the automatic gearbox. So, when looking for routes online, we needed to stick to ones rated for "high-clearance vehicles." The AWD would be our reserve, hopefully enough to get us out of any sticky situations. We found a PDF guide produced by the park with a list of roads and settled on "one of the most remote locations in California." Before taking off, we cross-referenced the route three ways. This gave us reasonable surety that we wouldn't be turning around two miles in, wasting our weekend because the road turned out to be tougher than expected. Google Earth: An invaluable tool to any adventurer. Not only can you find unlisted dirt roads, but the embedded pictures allow you to get up close and personal with on-the-ground pictures along the way. Firsthand Experience: Spend some time with search terms in Google and you'll likely be able to find a forum discussion or travel log about your destination. Bonus points if it's recent. Mine these for pictures and data on road conditions, terrain difficulty and any possible warnings. Road Conditions: Death Valley National Park produces a "Morning Report" PDF every day, listing roads that are damaged or closed, along with weather conditions and forecast. Since the weather there can change very rapidly and the location is very remote, don't rely on regional weather forecasts. Plan for the worst possible scenario and you'll never be taken by surprise. For the vehicle, we made sure the spare was in good condition and inflated and that the jack and other tools were present and functional. Oil looked clean and there was plenty of it, coolant was topped off, too. Most importantly, tires were fresh. Worn out ones are more prone to flats, just what you don't need 78 miles from nowhere in Death Valley. In case we got stuck, I also packed a decent shovel, but really, with only an AWD crossover, we'd likely be waiting for help if the vehicle became immobilized. Just as important as the vehicle, we needed to prepare to survive possible breakdown in harsh weather conditions. Outdoors, the quickest way to die is through hyper or hypothermia. Getting too hot or too cold. You can regulate heat by staying out of the sun and by drinking a ton of water. In a place like Death Valley, a human needs, at a minimum a gallon of water a day. Going for two, we packed five, just in case. Going in November, we also packed warm clothes and 0-degree rated sleeping bags. A comprehensive first aid kit, sunblock, baseball caps, sunglasses, long sleeved shirts and other tools came too. Even if you just plan to drive through the wilderness, plan to survive in it. Know what will stop you, and avoid that stuff. Discounting the chances of rolling over 1,000-foot cliffs, there's two things that will stop you off-road: blowing a tire or losing traction. So, while driving on difficult terrain, you need to do everything you can to avoid either. The trick is to control the position of all four wheels at all times. Watch out for sharp rocks, cacti and other dangers while simultaneously keeping a sharp eye out for soft sand, mud or anything that looks like your tires would sink in or just spin out. A good trick is to divide the road in front of you into 20-foot sections or so, then before you reach that section, have a route through it planned. On the dirt, that doesn't necessarily mean driving down the middle. It might mean cutting across the road at 90 degrees or winding around obstacles. The idea is to avoid any potential hazards. Typically though, the best policy is simply to place your wheels in the firm packed tire tracks left by previous vehicles. These are the least likely places to encounter something sharp enough to penetrate a tire and the surface is often going to be firm enough for good traction. When speed is good and when speed is bad. It's common sense that you want to roll over potential hazards as slowly as possible to avoid putting undue stress on your tires. A tall, pointy rock that's a bump at 5 MPH might become a blowout at 35 MPH. Spot those obstacles before hand and be gentle. But that's not to say you should poke along all the time. On Saline Valley Road, we encountered snow, mud puddles and soft sand, any one of which could have stopped us. When we saw them though, we evaluated the terrain before or after, then made sure we carried adequate momentum through to avoid getting stuck. A 4,000 Lbs SUV has a lot of momentum at 30 MPH or so, rolling through mud while staying on the gas and off the brake makes that momentum work for you. A quick lesson in vehicle dynamics. When you brake, your front suspension compresses. When you accelerate, it extends. Use this to your advantage. Approaching an obstacle you want to climb like, say, a large rock, don't brake as you go over it. Doing so will be tougher on your car as there's less suspension travel to soak up to the bump. Instead, crawl up to the obstacle at a walking pace, then floor the accelerator for a split second to get over it. Doing so will allow the suspension to absorb the shock in the best possible way. Your car gives you lots of tools you can use to your advantage off road. Keeping it in first gear (even on an auto, you can often override) on descents will help manage your speed while allowing you to keep off the brakes, keeping the suspension uncompressed. Any time you come to a stop, do so on as level a surface as possible. Make sure it's firm too. Apply your parking brake and roll a window down before you get out of the car. There's no one to call for help out here, so make sure you don't need to. Taking a vehicle to the extremes of its capability leaves very little room for error. Don't make errors. We knew we could get through that mud puddle because we got out and walked it first. I picked up a stick and stuck it in the middle, evaluating the depth of the water and the surface underneath. Anytime the road looked dodgy, I got out and walked ahead of the car, guiding it around potential hazards and making sure the terrain didn't contain any surprises. Turning on to Ube Hebe Road, things quickly got too tight and too loose. We stopped and backed up 400 yards to Saline Valley Road. It would have been cool to explore, but it wouldn't have been cool to get stuck. Whatever car you drive, it's probably a lot more capable than you think it is. Having said that, a little mechanical sympathy goes a long way. Don't drive so fast that it feels like the dashboard is going to fall off. Leave extra room between you and big rocks on the side of the road to avoid damaging your bodywork. Have a good idea of what your ground clearance is like, then don't even come close to maxing it out over obstacles. If it all goes wrong. If you get stuck, there are things you can do to get unstuck. On soft surfaces, try digging below the wheels and placing rocks, floormats or other grippy objects underneath them and on their path of travel. Can't go forward? Go back. You'll figure it out. If, for some reason, you don't, do not leave your vehicle. Even in a place like Death Valley, even if you didn't leave a trip plan with friends back home, your best chance to find help is simply to wait for it. Someone will, eventually, come along and find you. Staying with your car gives you ready access to all the supplies your brought, gives you shelter and makes you easy to spot. It also minimizes your energy expenditure and hydration needs, while keeping you close to all that water you brought, just in case. Sit in the shade, stay hydrated and regulate your temperature. You won't starve to death for at least two weeks, so don't worry too much about food. Need to signal for help? That spare tire, thrown on top of a wood fire, will create a giant pillar of black smoke. Someone will see that smoke and come get you. Don't panic. Thanks Frank, for trusting that I wouldn't damage your car or get you killed.